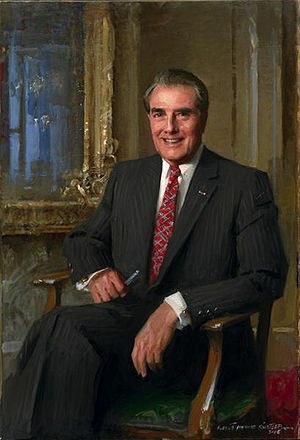 The official portrait of Senator Bob Dole by Everett Raymond Kinstler; Dole's portrait was unveiled in 2005, as is the tradition to construct a portrait for Senate leaders. Robert Joseph Dole, born July 22, 1923 (age 95), was a United States Senator from Kansas from 1969 to 1996 and the Republican presidential candidate in the 1996 US election, as well as the running mate of Gerald Ford in the 1976 election. He was the majority leader of the United States Senate from 1985-1987 and again from 1995-1996, when he resigned to focus on his presidential campaign. He was defeated by incumbent president Bill Clinton. He also served as Senate minority leader from 1987-1996, when he stepped down to devote full-time to his presidential bid. In 1942, Dole joined the Army's Enlisted Reserve Corps to fight in World War II. He became a second lieutenant in the Army's 10th Mountain Division. By April 1945, he was fighting the Germans in the hills of Italy where the action was fast-paced. One of the platoon's radio men was hit. Bob Dole crawled out of his foxhole to help him, but it was too late. Suddenly, while trying to assist the downed radio man, Dole was hit by German machine gun fire in the upper right back destroying his shoulder, and his right arm was so damaged that it was unrecognizable. Dole was immediately given morphine by an Army field medic to alleviate the pain, and his forehead was marked with an "M" in his own blood to alert medics. He was not expected to live. Dole waited nine long hours on the Italian battlefield before he was finally taken to the Fifteenth Evacuation Hospital. After a brief stay in a field Army hospital in Italy, he was transported back to the United States and to Topeka's Winter General Army Hospital, where he continued his painful recovery and endured a kidney operation. Then, he was transferred to Percy Jones Army Medical Center in Michigan, where he survived his second brush with death—blood clotting. He was a patient in that hospital along with Phillip A. Hart, whose name graces one of the U.S. Senate office buildings, where Bob Dole occupied an office. Eventually, he returned to Percy Jones Army Medical Hospital for extensive therapy on his rebuilt arm. It took about three years and nine operations for Bob Dole to rehabilitate. He learned to strengthen his injured arm, and also had to learn how to write with his left hand, as the doctors could not rebuild the excessive damage done by the German machine gun fire. Bob Dole was twice decorated for heroic achievement, receiving two Purple Hearts for his injuries, and the Bronze Star Medal for his attempt to assist the downed radio man. This page was last modified on 16 April 2018, at 14:32. This page has been accessed 21,190 times.